For one night only next week, The Late Show will go back in time and reunite The Daily Show. It's hard to believe, but it has been 20 years since Stephen Colbert joined the cast of The Daily Show, which at the time was hosted by Craig Kilborn. Colbert started as 1 of 4 correspondents who filmed segments out in the field and developed a character around his segments and would often spar with Daily Show host Jon Stewart. Colbert announced that he was getting together with some old friends next week since the actual anniversary falls on a June date, when the show is on a vacation. Stephen Colbert brought the anniversary up on Tuesday's Late Show show. Here's what he had to say about the big event. "I'm coming up on my 20th anniversary of having started on The Daily Show, 20 years! I don't look it." Deadline reports that Colbert will welcome his former "boss," Jon Stewart, along with John Oliver, Samantha Bee, Ed Helms, and Rob Corddry to his CBS Late Show on Tuesday May 9th. Stewart, who serves as an executive producer of The Late Show has been on a few times since the show debuted in September of 2015, but this will be the first time that everybody will be on all together. Colbert was a correspondent on The Daily Show from 1997 to 2005 before launching his own show, The Colbert Report, which was a spin-off of The Daily Show. The show was a parody of cable news shows at the time like Hannity, The O'Reilly Factor, and Glenn Beck where Colbert played the part of a right-wing pundit and held interviews. The 1-2 punch of The Daily Show and The Colbert Report was a great success for Comedy Central and earned some of the network's highest ratings as well as propelling Colbert's popularity. CBS announced in April of 2014 that Colbert would be taking over hosting duties for The Late Show from the retiring David Letterman. 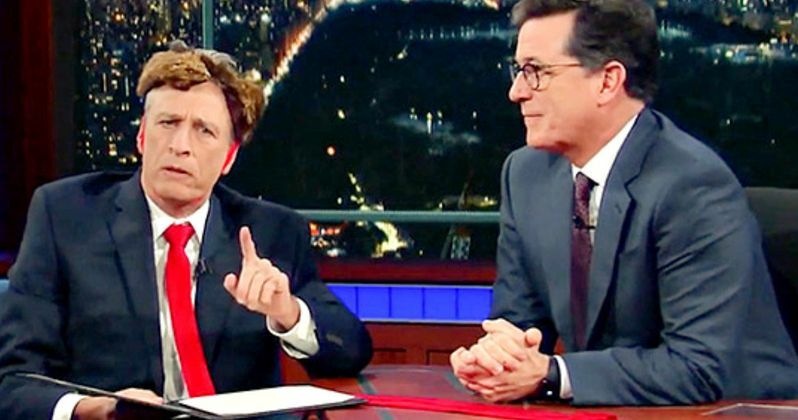 The reunion comes at a time of controversy for Colbert after he made some comments about Donald Trump that some found offensive. Colbert went on a 60 second rant about Trump on Monday night and Trump supporters took to social media to demand that Colbert be fired for his comments. Colbert didn't apologize and stood by his comments, choosing to believe that Trump can take care of himself. It is likely that this controversy will be brought up on the reunion show next week. The Late Show is enjoying a recent ratings upswing thanks to the political nature of Colbert's monologues. The show is currently enjoying it's 13th consecutive week ratings victory over The Tonight Show with Jimmy Fallon. While it's not known what the reunion will cover, one could probably guess what the main topic will be. Both Oliver and Bee have their own shows on HBO and TBS, respectively and both shows are heavily political. The Daily Show reunion airs Tuesday May 9th on CBS. Where's Steve Carell? We could all use some Even Stephen.